Are you one of those people who was too late to pre-order an HQ Eevee? Or...wanted to buy it but was in debate and by the time you decided it's just a hassle now. 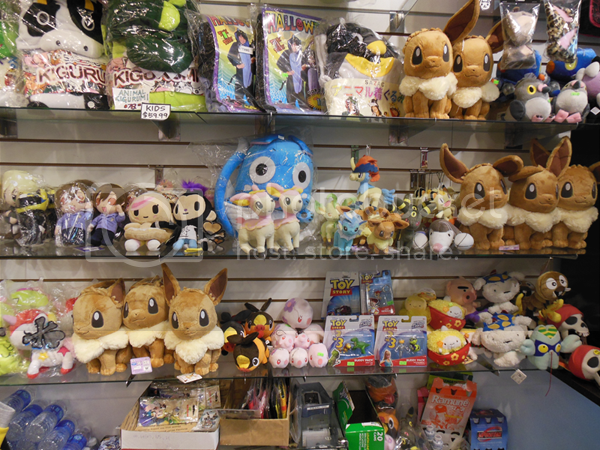 >< Well today I visited Japantown (San Francisco) and inJPNtoys was a LOT of HQ I Love Eevees! 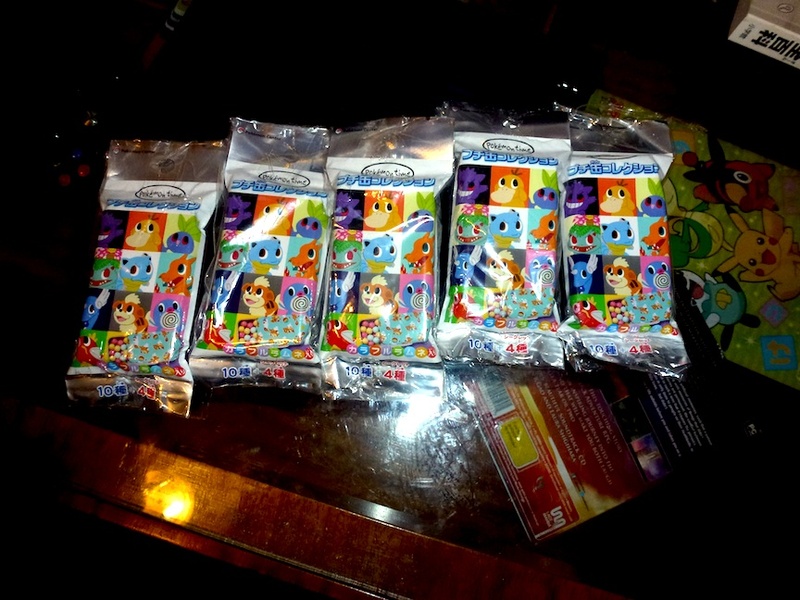 :D They just came in and there is a huge batch as well as some of the smaller eeveeloutions. They have a bunch of unopened/still packaged HQ Eevees in the back as well. They are selling them for $36...although for some reason when I was charged it was $38.99. I asked the lady for a discount though which was 15% though and got it for $35.96, I'm not complaining about the price mishap though about this since she gave me a discount and either way it shaved off tax and a tiny bit more. The eeveeloution keychains were about $20~ (I can't remember) Although this Eevee is a little bit more than say JapanVideoGame's - when you add in their shipping this is much cheaper. They DO have an ebay store, but I actually am reccomending this for bay area people / people who possibly plan to visit since they might still be here. Since there's no need to worry about any shipping costs. ;o; I absolutely am estatic that they had them since I was going to just order one online but managed to save almost $15. I heard from how everyone was saying how fluffy this eevee is and he really is *__* I love my talky eevee but this one is just so adorable. Pickups are now CLOSED! My list is full, so as long as your name appears below, you are on it. Please keep in mind I need to have your payment by Tues Japan time (Mon night EST) or I won't buy your items. Thanks! i love eevee - first chapter is finally over! It is my absolutely great pleasure to announce that as of this very moment, every single "I Love Eevee" HQ Eevee and Keychain Plush (Wave One) that has shipping paid for has been shipped! That's right, all 148 packages, all shipped securely, done and dusted! =D I have sent PMs to each and every participant with your mail details, do check your inbox. It has truly been a rollercoaster ride. This is without a doubt the most ambitious and challenging Pkmncollectors project I ever took on to date. We're talking 100 HQ Eevees and almost 300 Keychain Plush! For those of you who have been with me since my journey from the very beginning, and witnessed everything that has happened thus far, you know the odds have been so stacked, but the first step in the journey has finally been completed! I could not have done it without some of the kindest, gracious and simply most amazing souls amongst you who helped me in your ways throughout the highs and the lows. =_) I would like to thank everybody who participated, and hope you enjoy your lovely new plush. :D They *should* reach everybody in time for Christmas or at the very least before the New Year! For those who are involved with Keychain Plush Wave 2, I'd start collection of the remainder payment and shipping payment sometime around the 20th! Details will follow in due course. Also, this is a final shoutout to Winterfresh100, Zannid, Waticevixen7, Dinomuffinbot, Myvampirelust19, Pacificpikachu, Salacberry, Sonicelectronic, and _nofuturenohope - I have given everybody about 2-3 weeks' time to pay, and if I do not receive shipping payment in the next few days, your next shipping date will be much later in mid-December when I can next go to the Post Office. You have been warned! Lastly, in case anybody is interested, I have some Eevee Keychain Plush for sale, they would be $27 shipped each, this price is inclusive of compulsory registered mail/signature confirmation. Let me know if you are interested! and I believe this error occurs only if you have underscores in your name, though don't quote me on that, as I haven't fully tested it it occurs on some usernames without underscores too, my new theory is that it breaks on long usernames :P.
This error is 100% on LJ's side, their latest version appears to have broken their OpenID system, and as such I am unable to do anything about it. According to the LJ support center, it is a known issue and they are looking into fixing it (source), so hopefully it will resolve shortly. (You will find that if you have errors logging into feedback you also won't be able to log into any other OpenID site with your LJ). I suggest that if you have feedback you want to leave and you're affected by this issue, keep a text file or spreadsheet of it, and just input it when the problem is fixed. I apologise for any inconvenience. NOW EXCUSE ME WHILE I GO RAGE ABOUT OTHER PEOPLE'S BAD CODE BREAKING MY CODE THIS IS SOMETHING I GET VERY ANGRY ABOUT MED!CHAAAAAAAAAAMMMMMMMMMMMMMMMM!!!111!!!! This post is for those who can't deside to buy a plush because they are not sure of the size of a plush ^-^' just like me since I don't have much place to display them. 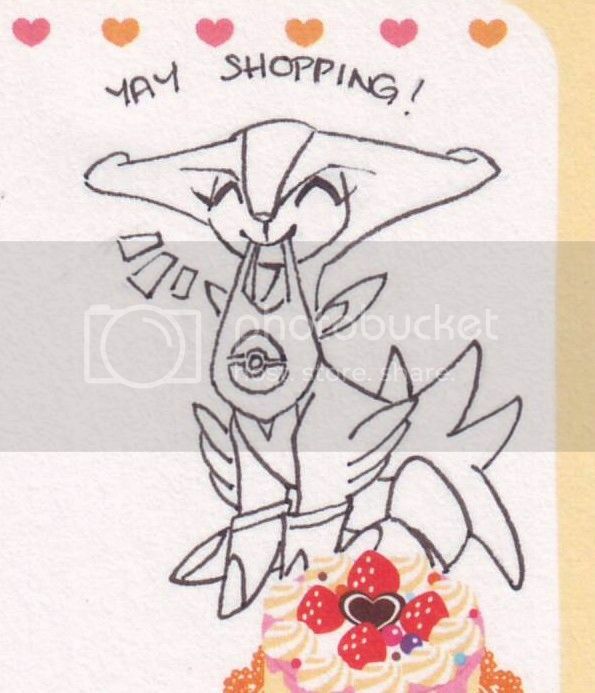 Pokemon time tin gets, cupcakes and a horrifying vision! They were blind package gets, and I bought them both for the tins and for the ridiculously addictive candy. I had actually bought a Farfetch'd tin from here, and so was hoping not to get him again! I've also had some fun recently with making Pokemon-themed birthday cupcakes, which turned out okay-looking and very delicious! We won!! And without almost any competition too, so there'll be great discounts for all! I'll post the payment post tomorrow morning, so remember to keep checking the community. Also, I would like to know, where everyone lives, so I can calculate the PP fees right from the start. The country is enough. You can comment in here or in the original GA post. I'll comment to all winners there about this, so everyone should get a comment notice from LJ. But I included this just in case people have the notifications turned off. It's been exactly 6 months since I posted my introduction here! It seems to be such a short time ago. But at the same time, this place feels so familiar and cozy already, that I could have been here forever! I have met nice and helpful people (really, this place must have the friendliest atmosphere on the net! ), seen many AWESOME collections, learned a lot about collecting and of course bought hundreds of items to add to my own collection. I feel so happy to be a part of this community. <3 And to all the newer members, a short re-introduction might be in order, before I'll show you some before and after pictures. Hi everyone! I'm Dialny, a finnish woman, who has loved Pokemon since the beginning. I have always liked collecting and I also have a habit to devote way too much time and energy into one fandom at a time. Pokemon has been this fandom for the last 3 years, so my interest evolving into a collection was just the matter of time. And sources, because Finland doesn't get almost any pokemon merchandise anymore, at least outside anime conventions. When I started, I wasn't really sure, what I wanted to collect. I started with a main collection of shiny-repainted Tomy figures and side collections of Yanma, Lilligant and Zorua. I also bought random items here and there, because I just found them too cute to resist. I was quite afraid of the competition, so I tried to stay away from Eevee and Umbreon, even though they are my two favorite Pokemon. But over time I found myself buying more and more of them... So when I finally gave up to my love, two of my current main collections were born. I also didn't mean to collect too much official shinies, but after getting the shiny Suicune plush and some nice Kids lots from Y!J, they were also added to my main collections list. Recently I had to sell my Lilligants and Zoruas to make more room after the Eevee promotion, but almost completed Yanma collection is still here. And somehow I also managed to start a Canvas plush side collection. Oops? So now you know, what to expect. Let's start the update with a before/after picture~! I just joined pkmncollectors and I know that introductions are in order. Anyhow, I’ve included some photos of items I collect. Under the cut I’ve included: some photos of toys that I own, plushies I’ve recently ordered, my wishlist (only 1 item right now) and pokemon cards that I own. The post is quite long but I hope that’s alright. This is just a small compilation of some Pokemon toys that I own. 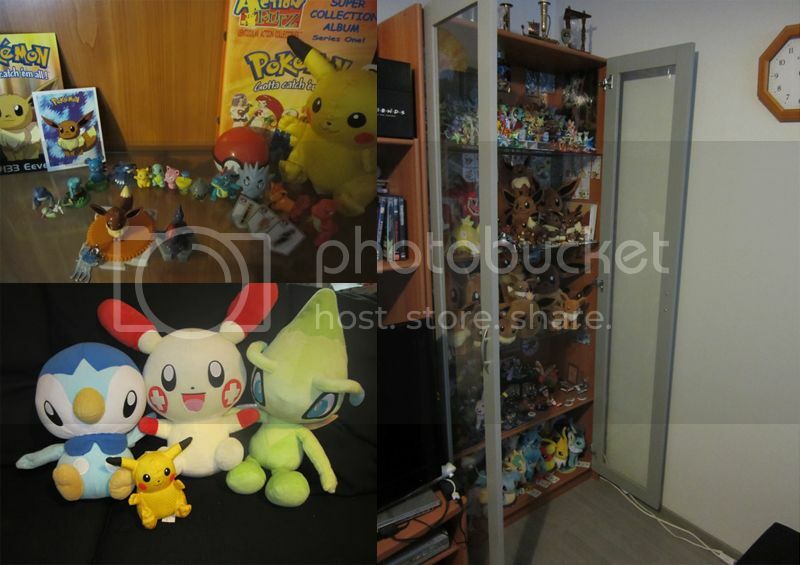 The Pikachu plush on the right was the first Pokemon toy that I ever owned. If I find where I put the rest of my stuff then I will post it up. Will post photos when they do. If anyone has it and is willing to sell it, please let me know and name your price. Below I have included photos of my current collection of Pokemon cards. Some of the cards (out of album) repeat in the album because they were put back inside. The album is not very organized I know, I really have to go through it. YOU MAY CALL ME, THE QUEEN OF FLATS. And just to slide this in here at the end, mine and Meowllz's GA for the VS cards does end in just 7 hours! NOW IM GOING TO MAKE A TEA. Hey guys! Long time no post I guess! Anyways, today I have a few questions for you all, some of the answers are for me, but some are just to hopefully start spirited discussion! 1. Are there any shops in London that stock Pokemon plushies? And out of these stores, would any of them happen to have any HQ eevees? 2. Does anybody know of there are going to be any conventions in London this Christmas? 3. What parts of your collection do you take on holiday with you if any? 4. Do you do anything special with your collection at Christmas? Yes and as you have probably already guessed, I am going to London this Christmas, so the first two questions were for me, but the second two are there hopefully provoke happy holiday discussion! I would leave my response to the last two questions here, but I don't really have time since my mum wants her iPad back....so happy holidays! Hello pkmncollectors! 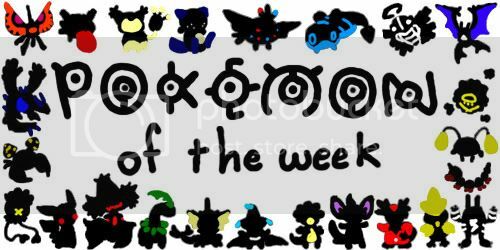 It's time for Pokemon of the Week!! Let's get started! I have had quite a few pacakges arrive in the last few weeks, been working my postman to death with all my GA's too. anyway i thought i would share my recent arrivals with you lovely people! Also all of those who paid for shipping for my GA's by saturday your packages have been shipped and should be with you soon, hopefully before the christmas rush hits too! check under the cut for my gets! So! A semi grail has appeared so I need to try haul out this lot of stuff! Hey everybody! As it just really got into the Christmas season, I started putting out my decorations, including a string of classic pokemon christmas tree lights, and I got to wondering what type of holiday merch we have in the community. Does anyone have any awesome seasonal pokemon items in their collection? I'd love to see what's out there in the way of a pokemon christmas! so does anyone have one they could sell me? Long shot I'm sure since i know not too many people like the ice cream Pokemon, but thought i'd ask. the rest of my wants are over here: click. so this post isn't boring, a recent get! does anyone else feel sad when you have to pack away your pokemons, even for a short amount of time?